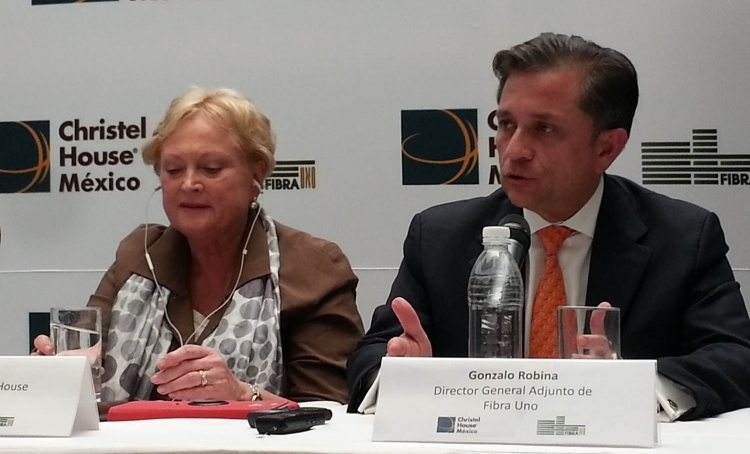 Christel House International founder Christel DeHaan and Fibra Uno Deputy General Director Gonzalo Robina announce the two organizations’ partnership at a press conference. Christel House Mexico and Fibra Uno, which is the first and largest investment trust real estate in Mexico, have formed a strategic social alliance to transform the lives of some of Mexico City’s most impoverished children. This collaboration, which reflects a $100 million peso investment by Fibra Uno, will give Christel House Mexico a new and expanded facility and the ability to serve more than twice as many students and their families. Students will be able to enter school in Pre-First and continue through grade 12 graduation. Then, they will complete the program with Work Study support, until they have finished post-secondary education and are established in the workforce. By selecting Christel House Mexico as its social responsibility partner, Fibra Uno is demonstrating its commitment to long-term human transformation. By investing in the future of these children, Fibra Uno is giving them the opportunity to maximize their potential and break the generational cycle of poverty. Dividends from this investment will be realized as these young people grow to become good citizens and productive members of society, providing for themselves and their families, and giving back to their communities. Both Christel House Mexico and its US affiliate, Christel House International, are extraordinarily grateful to Fibra Uno for its support. The new education center plans to begin operations in the 2015-2016 school year.